can I make a shirt with this. I love it! I have not taken responsibility for my weight, my size are my aches and pains. “Oh, this is what getting older does”. or of course “I don’t have that kind of time”. Tomorrow is my 23rd Wedding Anniversary and I am going to gift myself responsibility and find what feels good and stick with. Once again you have lifted our spirits. Your gentle message touched my heart. Thank you for organising the calendar. It’s a privilege to be part of your yoga community. They say “April is the cruelest month” but it appears that it’s not so ^^ Thank you. I absolutely LOVE you, Adrienne!!!! Thank you for the free calendar because i came back to yoga after several years. I found your youtube vidéo last december (2018) and now i do yoga every day about 40 to 60 minutes. I am 63 and i get better, more strong and flexible each day, little by little. So with your calendar i can do it every day, with a coach. The calendar doesn’t download for me like it usually does. Is there something different this month? If chakras aren’t my thing, what would be a good substitute for that day? Trying to keep the energy of that day while finding what feels good for me. I am using Google Chrome and the calendar is not downloading for me either. Thanks, and I will try again tomorrow. I just took a screenshot and I’ll print it this way. I did a right click then open in a new tab to print. Thanks – helpful advice. I right clicked, then saved image and pasted into Word. Just printing it out now. I love your commitment to sharing yoga with everyone. You have put a grateful smile on my face more times than I can count. I also have searched for specific practices to deal with a sore spot or trouble area, and I am so pleasantly surprised by how often you have a video for that! Your videos truly make yoga accessible every day. Truly, thank you, and Namaste! Didn’t download for me either. I did a screen shot and saved it to my desktop. Adriene, perhaps it would be good to invite people’s ideas on getting on not using single use plastic. Especially needed for me are ideas for produce purchase and protection in the frig. Fabric bags are good but take on moisture and foods dry out in the frdige. Paper is out because they break with moisture. I have been using ‘chux’ dishclothes ( That’s what they are called in Australia) to cover and wrap food instead of using cling wrap or expensive beeswax wraps! You can re-use, they wash well and then you compost them ! I recently discovered Bee´s wrap. Cloth with melted beeswax to cover a bowl of food in the fridge or wrap bread and such. Check it out! Same worked for me – right click to open image in a new tab and printed just fine! Looking forward to another month with you, Adriene! We try very hard to be mindful of not using single use items in our family – I love that you’re imploring us to take this challenge. I am setting the intention of not using plastic wrap of any kind this month. Probably will invest in some of the food-saver sleeves and might even look into making my own fabric/beeswax wraps! ;D Thank you for using your influence and presence in people’s lives for the good of the planet!! xo. No cal download for me either. Right click the calendar and click “print picture”. Rest I with all the way. I got a reusable straw today, I have my reusable water bottle, I printed my YWA calendar, and I’m ready for April! 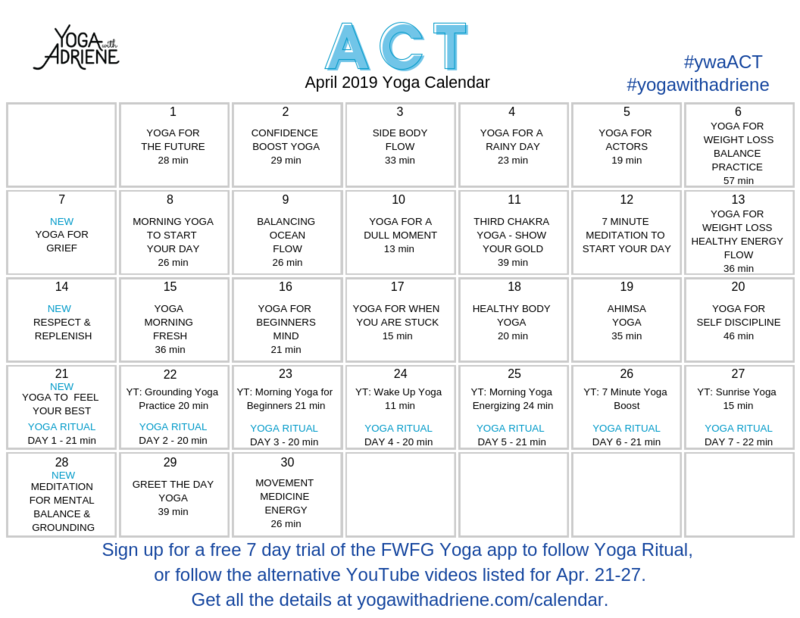 Thanks for the free yoga, Adriene! Which is, of course, so much more than yoga. You are definitely changing the world. I am 62 years young and have been participating in your yoga classes online for 2 years now. You and your classes have inspired me to be a much calmer human being and way more grounded. Thank you thank you thank you. Friends keep saying to me… you look great. Is it the hair? did you loose weight? I reply…” no it’s the yoga!” Ill keep on as long as I can keep on!. PS. looking for a wider yoga mat. I notice you mostly use a wider mat… any suggestions? I do not see any in your shop. Hi Adriene! I had my baby 4 months ago, it was a C-section, and I have almost a month now of practicing yoga at home with you and I absolutely love it! Recovery from surgery has been really hard for me and your classes have made me feel good and inspired. I am used to really strong workouts like crossfit, so it has been a journey for me to acknowledge where I am and what my body can handle now, and most important what it needs. Thanks you for your dedication and sharing with us. Big hugs from Nuremberg, Germany. Ps. Do you have any post-natal yoga videos? Hi Geraldina, Adriene does not have a specific post-natal practice or series yet but her Light – 7 Day Chakra Ride series on the membership is excellent for postpartum once cleared to return to exercise by the doctor! It’s an intermediate series, fair amount of balance work in a few, the whole series focuses on bandhas/locks, a lot of drawing up from pelvic floor and drawing in of naval. Mulabandha and Uddyiana bandha. You can try it out on the membership with the free 7 day trial to see if it is right for you. Thanks for the rainbow yoga(my first yoga class with you). Some laughs were had so I appreciate that. I downloaded 4 of your calendars. Will be fun to see how I incorporate those into my day. See you tomorrow morning. I just wanted to say thank you for your Yoga, your wise ideas and for the fact that everyone can just tune in and enjoy! I also love your weekly letters – the one from today (Easter Sunday) is really worth reading and I do agree very much! Yes, let’s enjoy life! !